Services - Ruane & Mudlock Funeral Home, Inc.
Our staff is made up of family, and we are committed to meeting the needs of you and your family. It is our intention to provide you with a comfortable environment, similar to that of your own home, in which to make decisions, greet friends and family, and fondly remember those whom we have lost. We are here 24 hours a day, 365 days a year to respond to your needs. 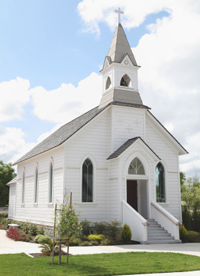 Our staff coordinates all aspects of the service plans with clergy, honor guards, cemetery personnel and any others involved in final disposition. We complete and order copies of the death certificate, as well as the Social Security and Veterans forms, and the disposition or burial permit. We will also complete or assist you in completing insurance forms and other documents that you may have. Each person who enters the doors of Ruane & Mudlock Funeral Home, Inc. receives the same caring and attentive service. First and foremost, we listen to you and your needs and thoughtfully guide you through the arrangements conference. Not all funeral homes in our area know you like we do. The Ruane and Mudlock families have been a part of this community for many years, and we sincerely care for you and your specific needs. It is never easy to think clearly and make decisions immediately following the loss of a loved one. For that reason, we are providing the following information. It is intended to make you aware of the services available today and to assist you in making a better, more informed decision at a later time. We take great care to offer services to those in our community who are seeking more personal ways to express grief and say goodbye to a loved one. Our attention is to listen closely to you and your family, and arrange a truly unique, completely personal service for your loved one. Online guest books. All comments left by Web site visitors are noted to the funeral register for the family. If your loved one dies far away from Pittston, we will help to return them home to you again. Also, should you wish a loved one to be interred outside of the Pittston area, we can make all the arrangements for you. We are located within 2 hours from international airports in Philadelphia and New York City and are ready to discuss these options with you. Every family is unique and has unique needs. Our family will consider all your financial and emotional constraints and will advise you in designing a funeral or memorial service that best suits your needs. We will also discuss payment options that would be least burdensome on your family. No matter what your budget or your vision for your loved one’s service, we are here to help. All veterans discharged other than dishonorably qualify for military funeral honors and many veteran benefits, regardless of their rank or the place of burial. Reserve due to a disability incurred or aggravated in the line of duty. Because of their honorable and selfless service, those who serve or have served in the military may be eligible for special funeral and burial benefits. 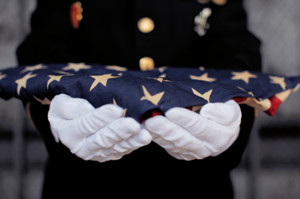 Many veterans and their families are not aware of the funeral and burial benefits available to them. Our staff is experienced in completing the necessary paperwork involved, and gladly takes the responsibility to do so – relieving the family of this burdensome task. We are completely committed to providing families of the veterans in our community with unsurpassed service, as they have already done for us. Our Veterans are honored by the local AmVETS, an honor guard, specially trained in the military rites and procedure. Our funeral home was established by a WW II veteran, and it is for this reason that we have an exceptionally deep love, admiration, appreciation, and duty toward all veterans. As with all of the services we offer, our expert staff will help your family design a truly memorable memorial service that reflects the life of your loved one. Additionally, we will work with your family to plan a suitable service that suits your budget. After all, we believe that you shouldn't have to pay a fortune to celebrate the treasured life of your loved one. The best known option is "direct" cremation. However, "direct" emphasizes no viewing or visitation, no service, and no casket or burial. If this was the wish of the deceased or other family members, we will be pleased to assist with this process. As the cremation rate has risen over the years, the funeral industry has had an opportunity to study the effects of direct cremation on the surviving loved ones. Research suggests that people who did not go through a funeral or memorial service for their loved one or lacked a physical location to lay flowers or other memorabilia found greater difficulty in experiencing closure following a loved one's death. For this reason, many experts advise having a traditional service before or after the actual cremation to provide friends and family with a final moment to say good-bye. It also affords the bereaved an opportunity to share their memories and provide support for each other. You may decide to choose cremation for a variety of reasons. Cremation can offer you both traditional and creative options in a funeral service. You may feel that cremation is a more "natural" option. Perhaps the attraction is that it can be a less expensive alternative to burial or entombment. Some choose cremation when families are separated by distance, thus allowing the cremains to be divided and kept in more than one specific location. 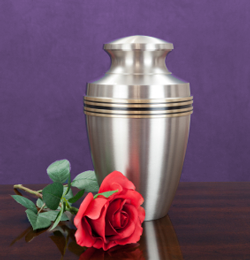 Decorative urns of various sizes provide the opportunity for families to share in the possession of their loved one's cremains, regardless of distance between family members. The services do not have to differ. The extent and the content of a cremation service is entirely subject to the wishes of the family. Families can choose as much or as little formality as they want. Quite often a memorial service is held after cremation has occurred. Families may delay memorial or committal services until a time when out of town family members and friends are able to gather. Is embalming necessary prior to cremation? Embalming is a necessity if there is a public viewing or a funeral with the body present. Many states do not require embalming for direct cremation. Most crematories require that the body at least be enclosed and in an acceptably rigid container. This container must be strong enough to assure the protection of the health and safety of the crematory operator. It should provide a proper covering for the body and meet reasonable standards of respect and dignity. Most crematories require that the container be composed of a combustible material. The body is cremated in the same enclosure in which it arrives at the crematory. Therefore, a casket is not required for cremation, but it is generally an acceptable container for cremation. The enclosed body is placed in the cremation chamber where through heat and evaporation the body is reduced to its basic elements, which are referred to as cremains (or cremated remains). It may surprise many to learn that since cremated remains have neither the appearance nor the chemical properties of ashes - they are, in fact, bone fragments and not actually ashes. After preparation, these elements are either placed in a permanent urn or in a temporary container that is suitable for transport. Depending upon the size of the body, three to nine pounds of fragments typically remain. Some people may regard cremation as such, but most families feel that the cremated remains of someone they love should be afforded a resting place that can be identified with the name and date of burial and death. This is memorialization. Most families find that a memorial, regardless of its size, serves a basic human need to remember and be remembered. Cremation is an acceptable means of final disposition, and families are free to choose how, where, and what they will do with the cremains. Many options are available and we will be pleased to discuss those with you. Should I choose a traditional service or a memorial? On the traditional side, a service before the cremation, including a visitation, casket, flowers, clergy, pallbearers, and viewing helps families to accept the reality that their loved one has died. A service following the cremation is generally known as a memorial service. The body of the deceased is not present for viewing and the types of memorial services vary greatly. A structured memorial service may include clergy and hymns. Others may be less traditional and more creative. In place of a funeral service, an invitation may be sent for a celebration of life in a restaurant, park, or family home. This type of celebration may include refreshments, shared stories about the deceased, non-traditional music, or any combination of these options. Many options exist for a final resting place for cremains. The family may choose from a full selection of urns for permanent containment of the cremated remains. The urns may be placed in a columbarium, which is a building or structure where single niche space or family units may be selected. Of course, family plots may be used and cemeteries often permit the inurnment of more than one urn in a plot. Some cemeteries require small vaults for urns. It is best to check with the cemetery of your choice as to what fees may be associated with inurnments. The basic charge for just cremation is somewhat less than traditional burial. However, with so many items of service available to the family, both as part of the funeral service before and in the mode of disposition after, it is not possible to make an accurate price comparison. Again, the family has the option to select as much or as little as they desire, and cremation offers many options. A greater number of people are choosing cremation today than at any other time in the past. Since cremation is irreversible, the subject should certainly be discussed among family members prior to or at the time of death. Due to emotional stress and confusion that can occur upon the death of a loved one, we encourage families to discuss cremation at a time prior to the time of death. Arrangements for memorialization may also be made at this time. What can I do with the cremains? There are many options available for the disposition of the cremains. Choices include purchasing an urn, which can be buried in a family plot. Another option is to purchase a more decorative urn in order to display the urn in a place of significance, such as a special room in the house. These options allow families to later visit the location of the cremains, aiding in final closure to family and friends who may still be grieving. Families often choose to purchase several "remembrance urns" or jewelry pieces for which to place a smaller, personal amount of cremains, thereby distributing the cremains among family members. Finally, families may choose to scatter the ashes in an acceptable location of special significance to the deceased. What does the Catholic Faith say about cremation? While the Catholic Faith permits cremation, it prefers that the body of the deceased be present for the funeral rites, namely the funeral liturgy. The "Order of Christian Burial" contains provisions for the cremation of the body after the final commendation that concludes the funeral liturgy. When it is not possible for the body to be present for the funeral liturgy, the Catholic Faith allows the cremated remains of the body to be present for the vigil, the funeral liturgy, and the committal rite. The parish church is the preferred place for the celebration of these rites. The cremated remains of the body are to be treated and handled with the same respect and dignity given to the corporal remains of the body. This includes choosing the method of final disposition. If cremation is chosen as the means of final disposition, the cremains are to be buried in the ground of a communal cemetery, preferably a Catholic Cemetery, or inurned in a columbarium. Therefore, the cultural practices of scattering cremains or separating them in multiple urns are not considered reverent or appropriate ways of disposition from the standpoint of the Catholic Faith. Whenever possible, appropriate memorialization of the deceased should be utilized at the place of burial.